Medical facilities are springing up in all areas of the nation, from small town clinics and nursing homes, to urban senior assisted living centers and regional hospitals. Given the diverse patient demographic and physical operations of these large-scale businesses, facilities management personnel are tasked with a very difficult challenge. One of these ongoing challenges is the amount and different types of medical facility waste. How can medical facilities effectively mitigate all of the different types of waste that are created daily on such a massive scale? These medical facilities create bio-waste, food waste, cardboard and paper waste, textile waste, and metal waste. It comes from cafeterias, restrooms, patient rooms, offices, shipping areas, and housekeeping. Each of the different areas within a medical or healthcare facility might have different needs for efficiency, labor FTE’s, budgets, and availability of space. A one-size-fits-all solution to medical facility waste certainly does not meet the needs of these ever expanding institutions. The expenses incurred with all of the equipment, time, and people necessary to manage this waste can be significant. More and more, medical facilities are working to cut costs, while improving the quality of care to the people they serve. To meet these challenges, facilities managers are constantly evaluating vendors that can provide them with a variety of quality equipment and services to get the job done. Because of the ongoing evolution of the industry, medical facilities need partners who operate with a total partnership approach. Facilities managers need to know that they are getting the lowest total cost of ownership for their operations. Harmony Enterprises has been the total solutions provider for the medical industry for decades. Hospitals, nursing homes, and clinics all have trusted Harmony to help them not only navigate their way through their waste and recycling challenges but also to come up with innovative ways to save time and money. Three recycling and waste handling solutions that have been successfully implemented in medical facilities in recent years are the SmartPack Automatic Trash Compactor, the 450SS Stainless Steel Indoor Trash Compactor, and the M42BC Vertical Cardboard Baler. Let’s take a closer look at these medical facility waste and recycling solutions! The SmartPack Automatic Trash Compactor is ideal for cafeteria, lobby, office, or high traffic hallway use. It replaces the need for a traditional can by providing an amazing 11:1 compaction ratio. The SmartPack’s “no touch” automatic door provides a safe and sanitary way for patients and guests to dispose of their waste. Employees have more time for other important tasks because the SmartPack waste is removed on a “just in time” basis. 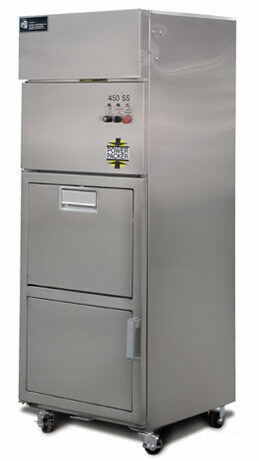 The 450SS Stainless Steel Indoor Trash Compactor is a must for any kitchen or back room application. This sanitary and powerful machine is safe to use, easy to operate and requires minimal floor space. With the 450SS, you are able to reduce labor costs, employee pilferage, and prevent dangerous fire hazards. Not only will you eliminate odor and pest control problems associated with open waste, by compacting waste at its source, you will save up to 70% on waste disposal costs. The powerful compaction of the Indoor Power Packer provides a 4:1 compaction ratio with typical outdoor dumpster storage. The M42BC Vertical Cardboard Baler has proven to be an essential asset in stockroom areas of medical facilities. This amazing baler fits into tight spaces, under low ceilings, and fits through most standard doorways. This cardboard baler’s quick cycle time, energy efficient motor, and heavy duty construction improve your business’ appearance, increases safety, and provides potential additional revenue with a marketable commodity. With the M42BC you can bale aluminum, plastic, and cardboard. All three of these quality recycling and waste handling solutions, when combined with Harmony Enterprises’ world-class customer service, maintenance plans, and options like our Insite Wireless Monitoring help medical facilities eradicate their problems with managing medical facility waste. Read more about the many customer success stories involving Harmony Enterprise equipment and service solutions in the medical industry. Harmony Enterprises manufactures balers, compactors, beverage extraction, and full product destruction equipment on a global scale. We are passionate about providing unique and lasting solutions for all of our customers across a wide variety of industry sectors. If you are interested in learning more about our quality products or services, please contact us or call us at 800-658-2320 today!